Dental Health Services Victoria in partnership with the Victorian Department of Health and Human Services has developed oral health profiles for local government to become more involved in promoting oral health in the community. For further information on the LGA oral health profiles, please contact Dr Anil Raichur, anil.raichur@dhsv.org.au or 03 9341 1197. Community water fluoridation helps protect teeth against tooth decay, and is the most effective way of allowing everybody access to the benefits of fluoride. To find out if your community’s water is fluoridated, click on the button below. This action guide has been developed in partnership between Dental Health Services Victoria and the Department of Health & Human Services to help local government improve oral health. Local government plays an important role in supporting the objectives of the Public Health and Wellbeing Act 2008. 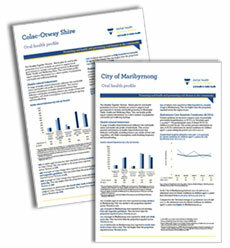 Councils can make an impact on their residents' oral health by helping to create environments that promote oral health. This guide outlines a range of evidence-informed actions that councils can consider when preparing their Municipal Public Health and Wellbeing Plans, Municipal Early Years Plans and other strategies. The proposed actions are consistent with the Victorian Public Health and Wellbeing Plan (VPHWP) 2015-2019; that identifies improving oral health as one of the key issues related to healthier eating and active living*. For further information please go to the municipal public health and wellbeing planning page on the Department of Health & Human Services website.